Eric, from Crispin and Cream, agreed to answer a few questions about Penn State’s upcoming season. 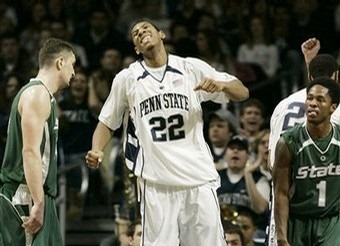 Penn State missed the tournament last year but went on the win the NIT. Overall it was a season that sparked fan interest (including bus loads making the trip to New York City) and saw a banner placed in the rafters of the Bryce Jordan Center. 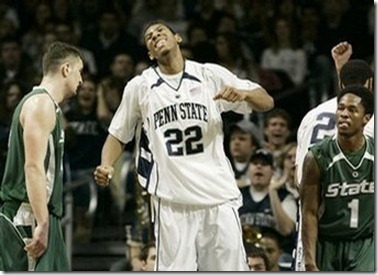 When I look at the Penn State program I see a lot of similarities to the Michigan team that won the NIT in 2004. A team who performed above expectations that fell just short of the NCAA tournament validated their season with an NIT championship. Expectations were high coming off of that season thanks mostly to a junior star in Daniel Horton. What are the expectations in State College for Talor Battle’s Nitany Lions this year? Honestly, I have no idea what the general expectations are among our fan base, but I hope they aren’t as high as I’m sure yours were for that UM team. There’s a level of enthusiasm, however, about the program that I’ve never seen before. People actually know the players and are excited for the season to start. I just hope the enthusiasm doesn’t create wild expectations. I can safely say everyone will be satisfied with just a NCAA berth, but looking around the league, who we’ve lost, and our conference schedule, that’s fairly unrealistic to expect until we see some evidence of what this team can do. How good can Talor Battle become? He’s clearly shown the knack for making the big play late in games, how will he adjust to losing his go-to guys in Jemelle Cornely and Stanley Pringle? That’s the question we’re all eagerly waiting to find out. His experience with the USA World University Games squad this summer has gotten nothing but rave reviews from Bo Ryan, Andy Katz, and anyone else associated with that team. Ryan was quoted as saying something along the lines of how Talor improved the most and how much he’ll regret it when they play PSU. I don’t think the loss of Pringle and Cornley are going to have any impact on Talor’s game. He’s going to be depended on to do the same things he was last year. I’m hoping he can improve his percentages, but I’m not sure if that could ever happen with how much he’s going to shoot. He at least needs to step his game up from the foul line, though. How about the incoming freshmen class? Any impact players there? We have 5 freshmen scholarship players. Billy Oliver is a 6’8″ forward who redshirted last year after suffering two concussions in preseason practice. We’ve been patiently waiting to see his game for what feels like years. Insiders rave about him, though, so he should have plenty of opportunities on the floor. 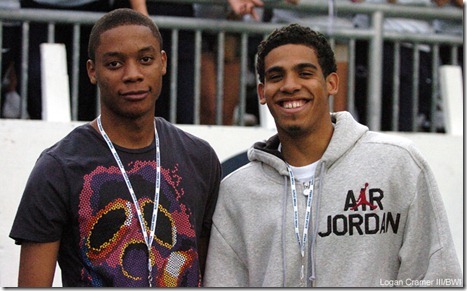 Tim Frazier is the guy I’m most excited about. He was ranked the #1 prospect in the state of Texas by TexasHoops.com. He’s super athletic but very unselfish. He had two other D-1 prospects on his HS team so he’s used to creating for other players. I think he’s going to be a fine complement to Battle. Bill Edwards should also see some significant time. UM showed some interest in him so you might know a little about him. He’s another 6’5″ F from Ohio, but he’s not a banger like Cornley. He’s a pure 3 with a nice shot and great court vision. The other 2 recruits, 6’9″ F Sasa Borovnjak and 6’4″ G Jermaine Marshall, aren’t expected to do too much. I think Marshall redshirts. Jeff Brooks, Chris Babb, David Jackson, and Cammeron Woodyard are relatively unknown… Are any of them good enough to become a consistent scorer on the wing? Jackson and Brooks are veterans. They’re unknowns because they haven’t consistently produced in 2 years. Brooks has yet to show that he can live up to his 4-star potential. Time is running out on him with how many new players we got to challenge for his playing time. David Jackson is a favorite of the staff’s. He’s just one of those guys who makes those key plays down the stretch. Grab a crucial offensive board here, hit clutch free throws there. He should start but I don’t know if he’s ever going to be a consistent scorer. That is what everyone is hoping Chris Babb becomes. He’s got a pure shot and showed last year he can be instant offense. He nailed three treys on the road at OSU in about 2 minutes, erasing an early 19-2 deficit. The jumper is there, but we have yet to see what he can do driving to the rack and creating. If he can put it all together and adjust to his increased role, he’ll be one of our main scoring threats. I would like to see more of Woodyard. He’s got some ability, as well. Similarly, who can step up and be a playmaker inside? The Nits don’t lose much size per say but Jamelle Cornley was one of the strongest and toughest kids in the Big Ten. Andrew Jones. I will never understand why we never tried to get him more involved with the offense last year. He was basically the garbage man inside who scored off rebounds. But with Cornley gone, he’s the inside man now. He’s a tenacious rebounder, but we’ll see how good he can be when he’s depended on to score his own points inside. His NIT run, including a 16 point, 15 rebound performance against All-American Luke Harangody, gives us reason for optimism. What are the highlights of Penn State’s non-conference schedule? As painful as it sounds this was probably the only thing keeping PSU out of the Dance last year. The highlight is it won’t keep us out of the NCAA tournament. There are essentially no 250+ RPI dogs, unlike last year’s abomination. My only gripe is there isn’t a marquee game against a ranked opponent. DeChellis claimed they were having trouble landing a marquee home game, which wound up being Virginia Tech. We also travel to Temple and Virginia, while participating in the Charleston Classic that includes South Carolina and Miami FL. I like this question because I’m curious if Battle gets any nods, especially from KJ. In a close game late, it would have to be Battle. But from a pure basketball standpoint, I’d have to go Manny. He’s the triple threat that could just go off at any second. How do you guard a guy who can get by you at will, get fouled, and make two foul shots every time? Evan Turner is a close 2nd, though. Predicted record for next year (conference and overall)? (7-11, 17-13) – I can’t see Talor Battle losing more games than he wins. There are no seniors on this team. So this is basically a two year journey with these guys. I’m very excited to see how good they become. It might be a little rough at times this year, but 2010-2011, along with the addition of Battle’s brother Taran Buie, is looking like a stellar year for the Lions.